I few weeks ago, I finally managed to go to Hung’s in Chinatown in London, upon the recommendation of London foodie, Helen Pang. Helen has never recommended anything that has disappointed. She was the one who introduced me to Gelupo Gelato and Gelupo is now a mainstay of my London trips–whatever the weather. So when Helen recommended Hung’s, I made a mental note to try the food there. I’m still, sort of, mourning the loss of Tai Ka Lok and I was still sort of looking for a restaurant to replace it in my list of absolute London Chinese restaurant maintstays. The first visit to Hung’s was so amazing that when we went to London again a few weeks later, it was a definite must-go-to. We had a lovely supper: braised mushrooms and pak choi, a portion of crispy pork, sweet and sour fish and boiled rice. The sweet and sour fish was absolutely divine! The fish was lovely and sweet and it kind of melted in your mouth! 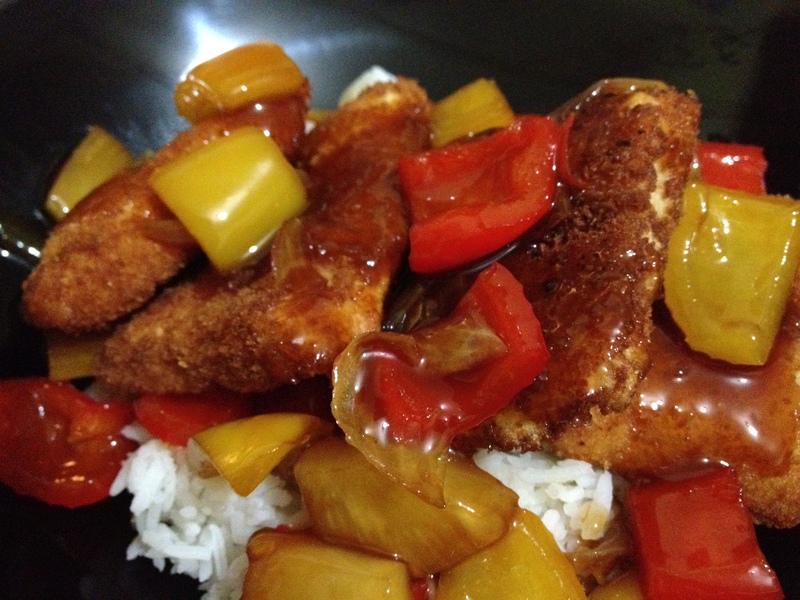 I’ve been dreaming of Hung’s sweet and sour fish that I had to do something similar at home. It was a pretty good idea because I had frozen basa fillets lounging in my freezer! My mom used to make sweet and sour sauce from scratch, Filipino style, but I wanted to see if I could make something closer to the Chinese style of making the sauce. I googled it and found a recipe that was so similar to my mom’s that I knew it was going to taste really nice. You can find the instructions for the recipe here. It cooks in 5 minutes and you can add anything you want to it. You just put together all the ingredients and cook it until it’s as thick as you want it to be. 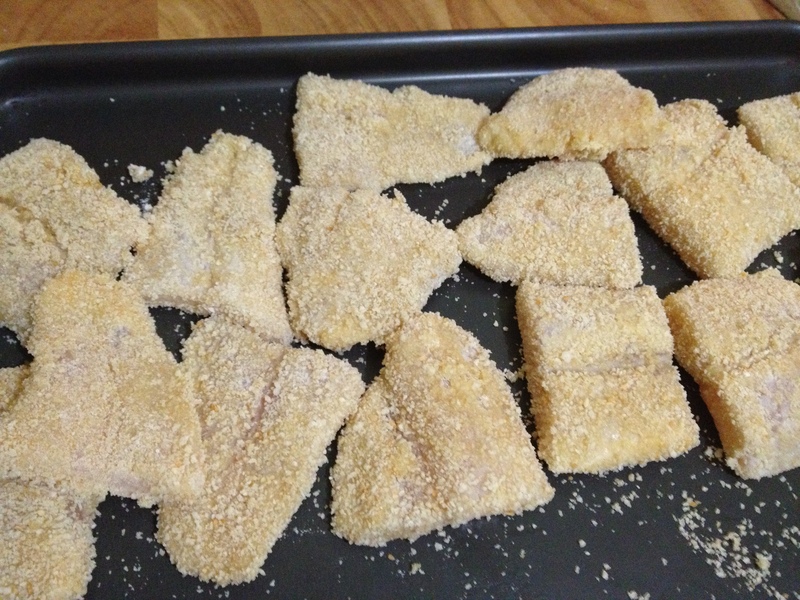 I breaded the fish before I fried them. I sort of love breading anything really. I do a little conveyor belt of the elements bowls of seasoned flour (or cornstarch), beaten egg and breadcrumbs. Depending on what you’re making, seasoned flour to me usually just means salt and pepper mixed in with the flour. One tip I learned from either Nigella or Ina Garten (it was so long ago that I can’t remember! It might even be Giada de Laurentis!) was to use just one hand so that you kept the other hand clean because breading things can be quite gluggy! 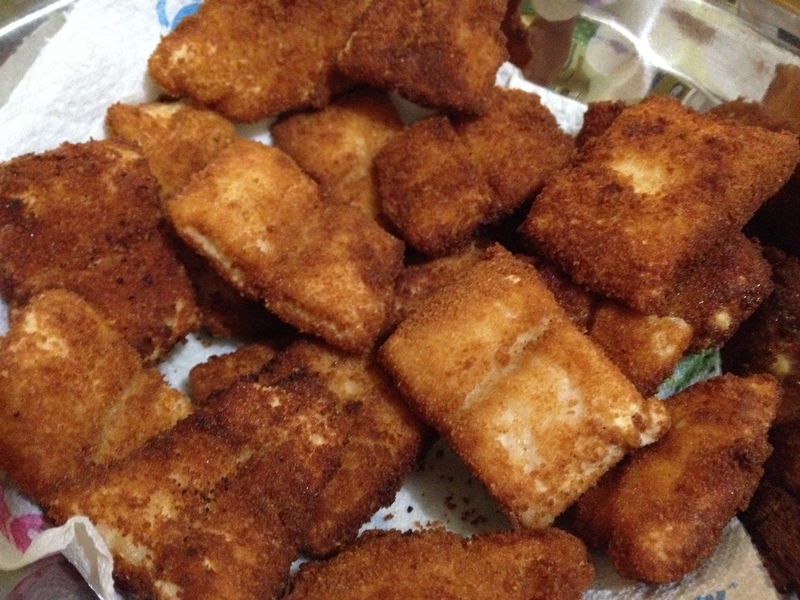 After breading the fish, I fried the fish to a crispy, lovely golden brown. Make sure that you rest them on kitchen paper so that the excess oil is absorbed. Then while the fish was cooling, I cooked the sweet and sour sauce. 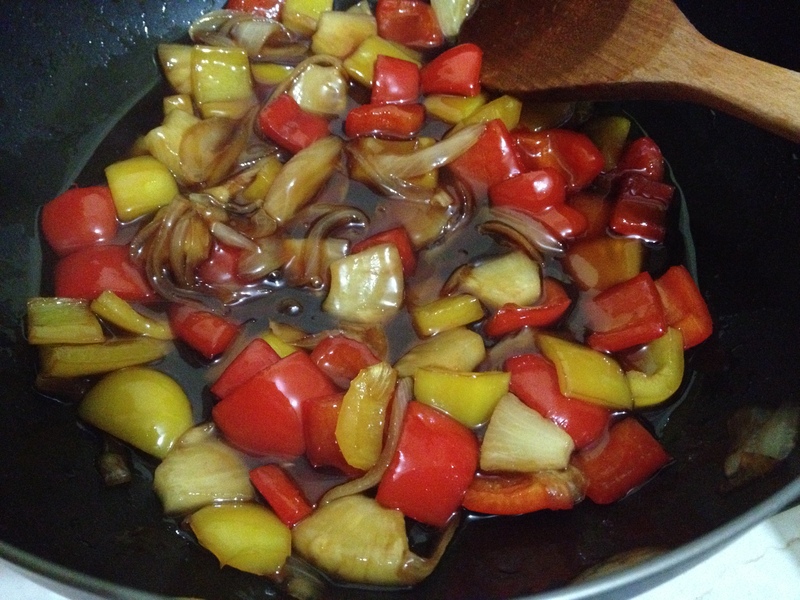 Instead of adding the cornstarch right away, I added sliced onions and chopped red and yellow bell peppers and allowed them to cook slightly. I added a few cubes of pineapple out from a tin. A slight variation from the recipe, instead of using 4 teaspoons of water, I added 4 tablespoons of the pineapple syrup from the tin to dissolve the cornstarch and added that to the cooking sauce. Once the sauce is at the thickness that you want it to be, you can assemble your dish. To keep the fish lovely and crispy, I suggest just pouring the sweet and sour sauce over it. And voila! You have sweet and sour fish! Next PostRum baba, yum baba!